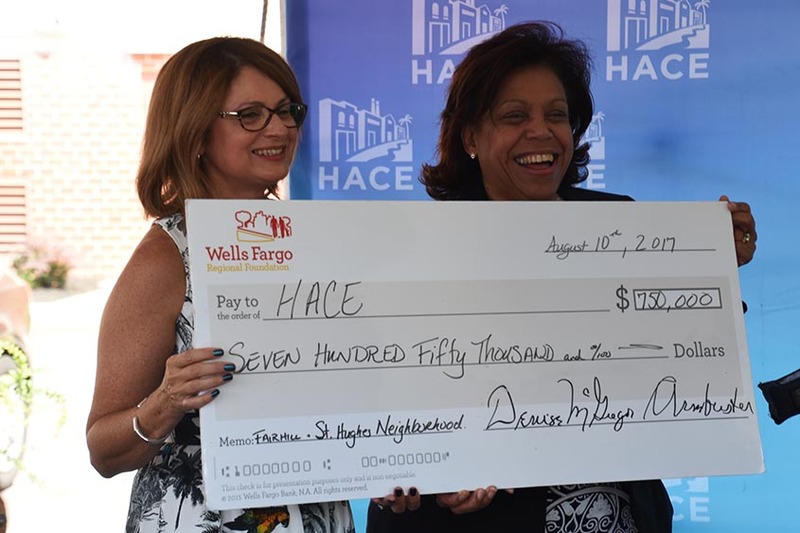 Philadelphia, PA.- August 10, 2017 – The Wells Fargo Regional Foundation (WFRF) awarded HACE $750,000 in grant funding over five years to HACE, formerly known as Hispanic Association of Contractors & Enterprises, for the implementation of The Good Lands 2025 Neighborhood Development Plan for the Fairhill and St. Hugh Neighborhoods in Eastern North Philadelphia. The announcement was made at Somerset Villas, located at 200 E. Somerset Street, HACE’s first affordable housing development for seniors—adjacent to the Gurney Street/Conrail viaduct in the Fairhill Neighborhood. Attendants at the announcement included Mayor James F. Kenney and Denise McGregor-Armbrister, Executive Director of the Wells Fargo Regional Foundation. HACE completed The Good Lands 2025 Neighborhood Development Plan in 2015 with support from the Wells Fargo Regional Foundation. The plan was developed with support and feedback from community residents, local organizations, and civic leaders to identify community needs, ranking them in terms of their priority, assess available resources within the community to meet the needs, and identify new private and public investments that can bridge the gap between the needs and what the community can accomplish on its own. The new multi-year grant award will support economic development initiatives, affordable rental housing, provision of social services for older adults and resident engagement through the creation of a Livability Academy.